Glen wrote about how Allen Miller's candidacy for county commissioner was some sort of shield against fellow non-partisan John Hutchings, benefiting Jim Cooper. His point was that Miller would take votes from Hutchings and possibly force a Cooper Miller run-off in November. At least on the top line results, that is sort of what happened. Cooper took over 35 percent of the votes in the five way primary while Hutchings and Miller fought it out for second at just under 20 percent. After all the voters were counted, Hutchings survived Miller and came out on top. This map shows each candidate's strongest dozen or so precincts, where I could assume each candidate had their strongest support. 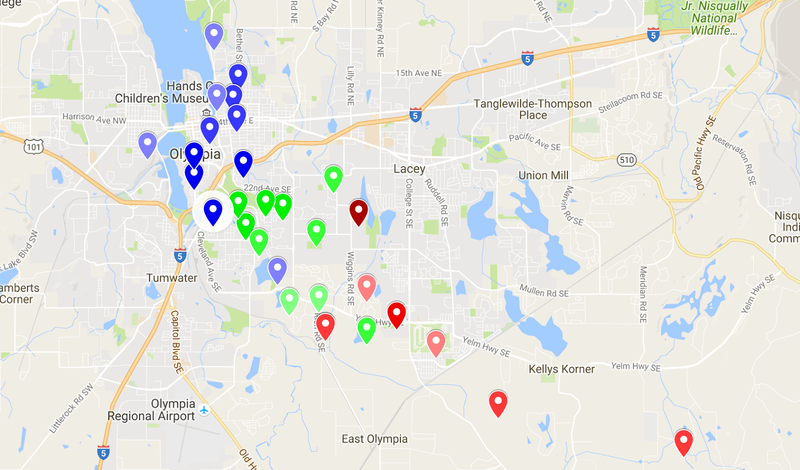 On the surface, you see something really interesting, Cooper did well in the inner northern Thurston precincts, Miller did well further out in the less walkable neighborhoods while Hutchings had his strongest support either much further out or right up next to Miller. This suburban band around the edge of the northern Thurston urban areas that Miller won is also lit up against Sue Gunn in her election. And, I suppose whether you believe Miller was a Cooper patsy is whether you believe Miller had more of an impact on Hutchings or Cooper. For me, election returns not-withstanding, I doubt Miller jumped into the race to support Cooper. Knowing Miller, his number one priority in public life is somehow preserving Capitol Lake. This isn't a massive secret. Cooper made a brave move recently on the city council to build in a position of pro-Deschutes estuary restoration on the city's primary planning document. If Miller enter the arena as some sort of pro-Cooper tank, he would have ignored his primary civic goal. Where does Bill Bryant's 100,000 come from?